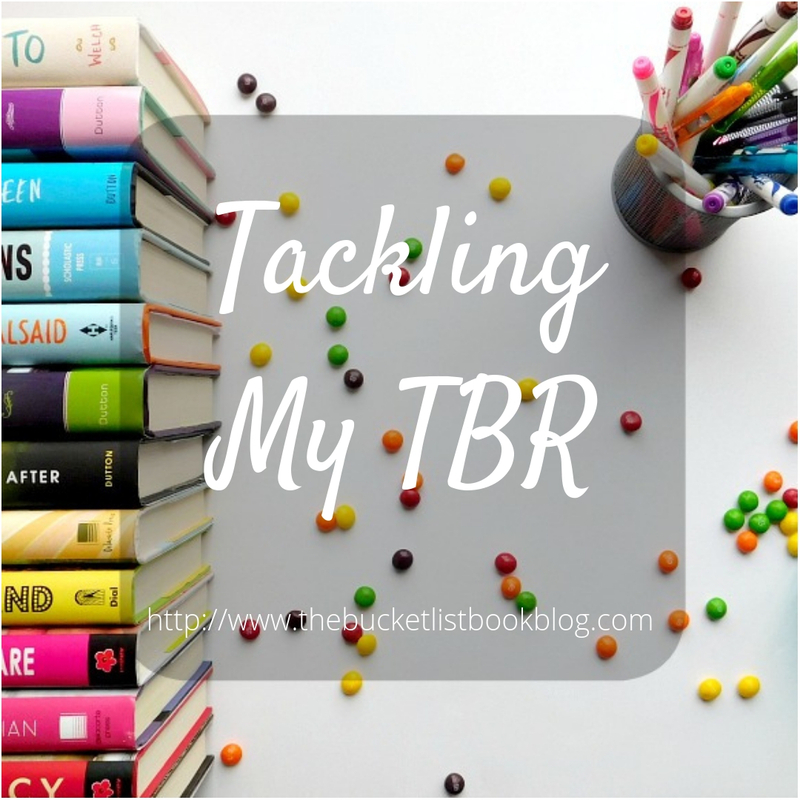 Last month, I challenged myself to read the books from my December 2009 and April 2010 book haul. There were only three books which was a great way to start a new challenge. Except one of those books were over 700 pages which is incredible daunting. So, I was able to finish Perfect You by Elizabeth Scott and Betrayals by Lili St. Crow. They both made it on my September Wrap Up post. Sadly, I am still in the middle of Dark Visions by L.J. Smith which has 3 books in 1. It will, hopefully, be finished by the end of this month. Now on to this month's reads from an old haul. Since I am a little late in posting a TBR, I've actually already started on a book which is why it will not show up in the screenshot. This month, I will be working through my August 2010 book haul of 6 books. 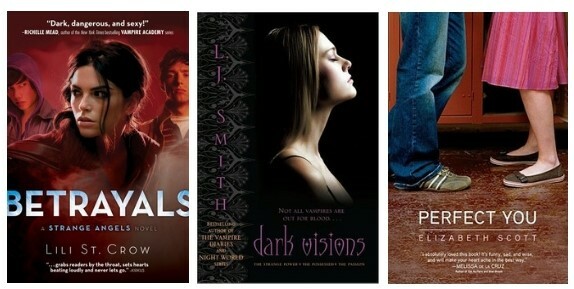 6 books is a little more frightening than just 3 but we shall see at the end of the month if I get these all done. And all these books just happen to be sequels of series I would like to keep since I own most of the books. Jealousy by Lili St. Crow: Since I read Betrayals last month, I'm ready to find out what happens next in the series. I wouldn't say it left me on a cliffhanger but at least, I remember what happened so we can jump right back into the story. Deadly Little Games by Laurie Faria Stolarz: I can't even remember reading the sequel but according to Goodreads, I rated and reviewed it. So, it's on to the third book. Don't worry, I'm going back and skimming the second to get a gist of where we left off. Stolarz is one of my autobuy authors so I'm pretty excited to get to this one. Angel by James Patterson: This one is available on audio at my library so it will definitely get done this month. I'm not too happy where the last book left off which is probably why I haven't continued on in the series. The series is about Max and her flock, a group of genetically altered bird children, who escape the School and try to get the word out of its evil. Awakened by P.C. Cast and Kristin Cast: I just finished this one! There's 12 books in this series and if I recall, Cast just created a new spin-off or continuation of this series that started this year. I don't know if I'll continue beyond the original 12. This is the 8th book and I'm kind of over it. The series is primarily about a boarding school that houses vampires where danger, it seems, is always lurking around every corner. 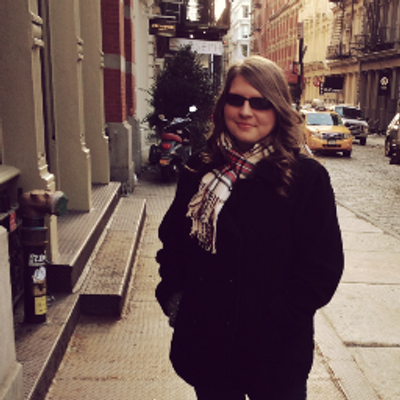 Ghost Town by Rachel Caine: This is another series that has gone on so long. 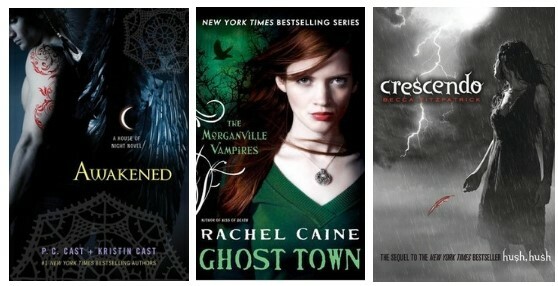 Ghost Town is book 9 in the Morganville Vampires series. I used to read these books with my brother and now that he's left for college, I've just stopped halfway through the series. It'll be nice to read about all my favorite characters again. Crescendo by Becca Fitzpatrick: The sequel to Hush, Hush has been at the bottom of my tbr for a very long time. It's not that I don't want to read it. I just do not remember Hush, Hush at all except there's Nora and Patch--Patch is a fallen angel--and Nora has a gym class where she has to climb a rope. I don't even know if that's right. Hopefully, I can find a recap of the book online so I can read Crescendo. 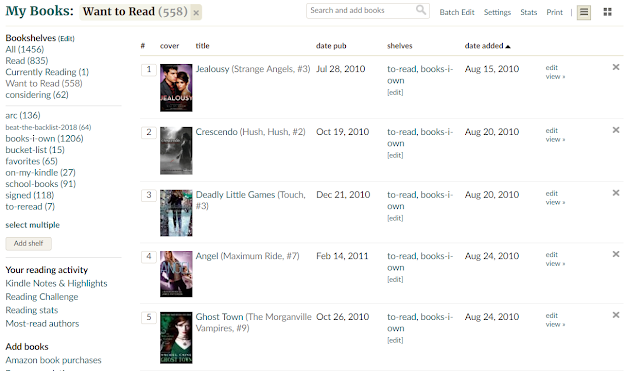 read a thriller - 3:59 by Gretchen McNeil: According to Goodreads, 3:59 has been catagorized as a thriller 25 times so I'm counting it! I don't read or own many thrillers so this challenge took me the longest to figure out. I've unhauled most of McNeil's books after reading Ten last year but I kept 3:59 because its premise sounds amazing. Josie has been having dreams about an alternate version of herself every night at 3:59. When she wakes, she finds a portal leading into the other world and she jumps at the chance to switch places with herself. Only problem... she doesn't have any way to come back. 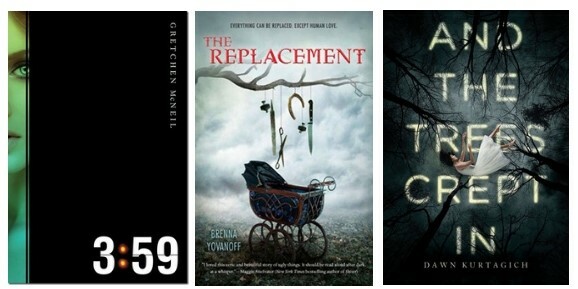 read a book with purple on the cover - The Replacement by Brenna Yovanoff: I was going to choose Beautiful Creatures by Kami Garcia and Margaret Stohl but that's over 500 pages so The Replacement has of twinge of purple in the baby carriage so we're going with that one. I can't really make sense of the synopsis but overall, it sounds like the main character may not be entirely human. When his friend's sister goes missing, he delves deep into an ancient evil realm to find her. read a book with a spooky word in the title - And the Trees Crept In by Dawn Kurtagich: Kurtagich freaked me out with The Dead House so I am so ready to get scared with And the Trees Crept In. "Crept" is a rather spooky word, don't you think? When Silla and Nori visit their aunt's house, there's no question the house is haunted. It seems that every time they look outside, the trees have moved closer. For me, that would be the time to run but, of course, Silla wants to uncover the secrets this house holds. read a book not set in the current time period - The Wren Hunt by Mary Watson: I'm not quite sure in what time period this book takes place. However, it is set in a fantastical world so I'm counting it for this challenge. Wren goes undercover as an intern to find a way to put a stop to a magical war. This book releases in November. read a book with pictures - Tales of the Peculiar by Ransom Riggs: I haven't picked up Map of Days yet but there's also pictures in this short story collection that goes along with Riggs' Peculiar series. It is probably the shortest book out of these 5 and I hope to read this in the middle of the week so it can serve as a break in between the bigger books I've chosen. What do you plan to read this month? What series have you been putting off because you don't want them to end?